The Massachusetts Institute of Technology (MIT) has released some findings of the first experiments carried out at the Large Hadron Collider (LHC). The findings that have come three months after the experiment resumed operations at 13 teraelectron volts (TeV) – the highest energy ever achieved in a laboratory – reveal that detection of mini black holes at the LHC could prove the existence of some parallel universes. According to the MIT news release, nearly 30 per cent more particles were produced per collision at 13 TeV as compared to those produced when the LHC first operated at 7 TeV. This has led to a “suspicion that higher energy collisions perhaps increase our chances of finding new particles”. “High energies of operation mean we can explore matter on a smaller scale by breaking down accelerating particles into even smaller particles, if they exist” says Biplob Bhattacharjee, assistant professor at the Centre for High Energy Physics, Indian Institute of Science, Bangalore (IISc). 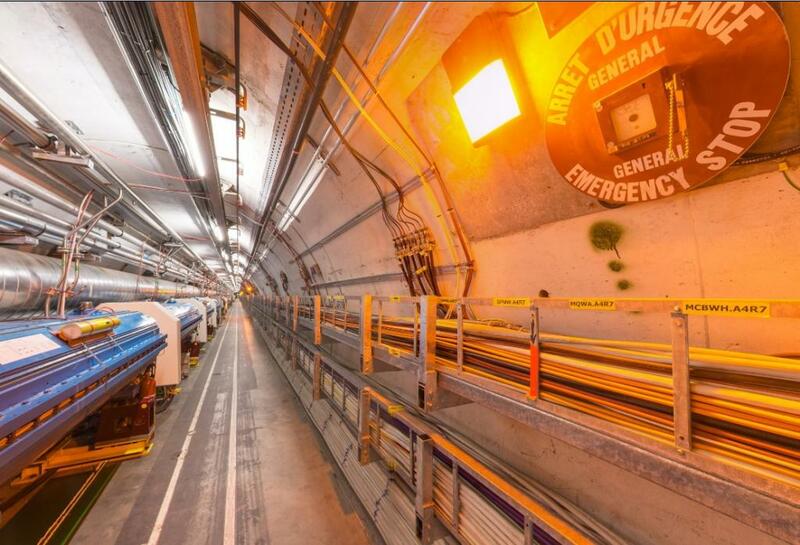 In the experimental run, physicists at the European Organization for Nuclear Research (CERN) sent two proton beams, each consisting of 476 bunches of 100 billion protons, hurtling towards each other at speeds close to the speed of light. Collisions were observed after every 50 nanoseconds, the Massachusetts Institute of Technology (MIT) said, in the release. A study reporting the findings of an average collision between two protons will appear in the journal Physics Letters B. “Particles may break into their smaller constituents when smashed at each other. This is the general-purpose strategy of any particle accelerator,” Bhattacharjee said. After analysing 20 million snapshots of the interacting beams, physicists identified 150,000 events containing proton-proton collisions. On an average, 22 charged particles known as hadrons were observed along the transverse plane around the main collision point. Hadrons, such as protons and neutrons, are made up of quarks and gluons and they interact via strong interactions, Bhattacharjee explained. Rohini M Godbole, professor at Centre for High Energy Physics, IISc, Bangalore, said that the collider was originally intended to operate at 14 TeV. However, owing to problems with the magnets used to create magnetic fields in order to accelerate particles, the first experiments in the LHC could only be carried out at 7-8 TeV. “Higher energies of operation lead us to find not only new particles, but also a greater number of known particles, like the top quark and the Higgs boson. If we have more particles in hand, we can study their properties better,” Godbole said, adding that we may also find evidence for dark matter. In fact, media reports state that the LHC will be fired up to its highest energy level next week in a bid to detect black holes. Physicists suspect that the experiment may even go on to create one. “Calculations predict that if gravity's rainbow is correct and extra dimensions also exist, then mini black holes will be formed at the LHC. They will be formed at the energies at which the LHC will be operating,” Mir Faizal, assistant professor at the University of Waterloo, said. Gravity's rainbow predicts if mini black holes should be formed at the LHC. So far, the LHC has searched for black holes at energy levels below 5.3 TeV, while a study carried out in March this year predicted that black holes may form at energy levels of at least 9.5 TeV in six dimensions and 11.9 TeV in 10 dimensions. Physicists believe that detection of black holes at the LHC would confirm the existence of extra dimensions. If these dimensions exist, only then can gravity leave our universe and get into them. This will reduce the energy required to form a mini black hole, which otherwise is way beyond the energies at the LHC, Faizal explained. “We have used a modified theory of gravity called gravity's rainbow that predicts that mini black holes should be formed at the LHC if extra dimensions exist. Imagine a piece of paper, which has a length and a width, so it is two dimensional. Now several sheets of paper can be placed parallel to each other along the height, which is the third dimension in this case. Similarly, many universes can be parallel to our universe, if extra dimensions exist. The detection of mini black holes at the LHC will prove the existence of such parallel universes,” Faizal said. Based at CERN, the LHC first began operations on September 10, 2008. It consists of a 27-kilometre long ring of superconducting magnets with a number of accelerating structures to boost the energy of particles and seven particle detectors, including the ATLAS (A Toroidal LHC ApparatuS), CMS (Compact Muon Solenoid), ALICE (A Large Ion Collider Experiment) and LHCb (Large Hadron Collider beauty) to detect collisions and their products.